Foot, Richard. "Election of 1917". The Canadian Encyclopedia, 18 December 2017, Historica Canada. https://www.thecanadianencyclopedia.ca/en/article/election-of-1917. Accessed 18 April 2019. ​In 1917, Canadians went to the polls on an issue that was literally one of life and death. In 1917, Canadians went to the polls on an issue that was literally one of life and death. Never before or since have the stakes in a national election been so high, and never has any federal campaign so deeply wounded and divided the country along linguistic lines. By the summer of 1917, Canada had been at war — the most desperate, deadly war the country had ever known — for nearly three years. The Canadian Expeditionary Force was serving with distinction on the Western Front, but the cost was high. More than 130,000 Canadians had been killed or maimed at battlefields whose names were still fresh in the national consciousness: Ypres, the Somme and Vimy Ridge. The slaughter of Passchendaele was only just beginning. Such losses required a steady flow of new recruits from home. 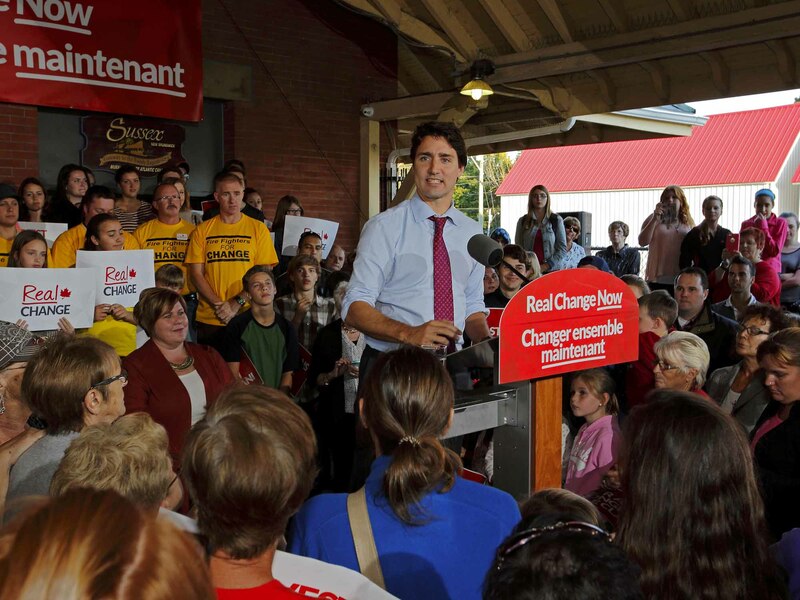 But the early enthusiasm with which Canadians had wanted to fight was waning. Recruitment of volunteers was drying up, thanks in part to the demands of farmers — themselves supplying food for the war effort — who needed sons and husbands at home to keep the farms ticking. Conservative Prime Minister Robert Borden had promised earlier not to conscript Canadians into military service. But that spring he had gone to Europe, where he'd assured other Allied leaders of Canada's commitment to the struggle. 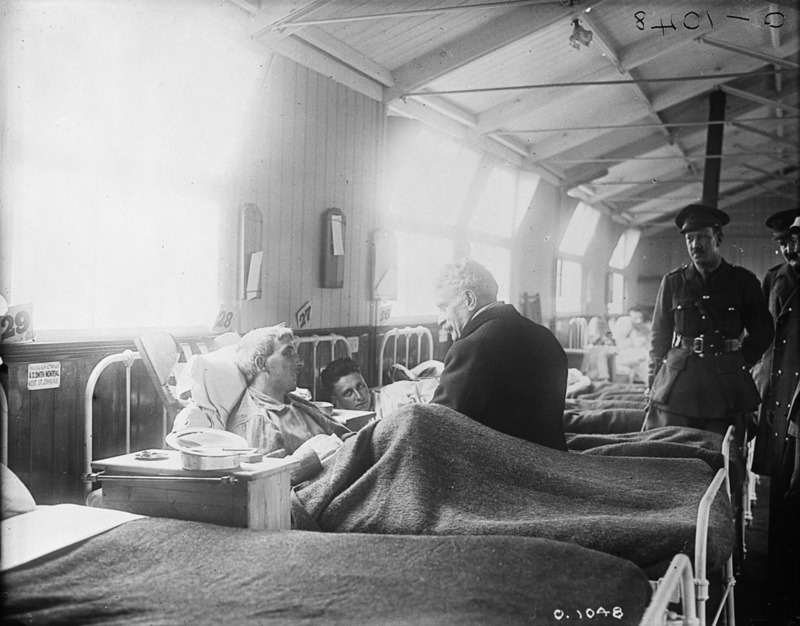 He had also been moved by visits with wounded and shell-shocked troops in hospital. He returned home determined that soldiers' sacrifices should not be in vain, convinced that Canada should see the war to the finish. He believed conscription was the only way. 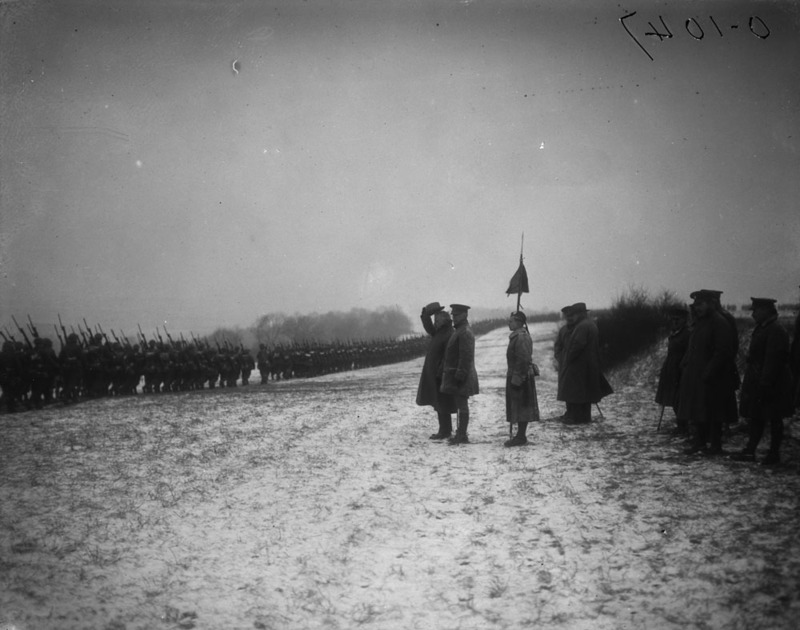 Prime Minister Robert Borden, taking the Salute of a Canadian batallion in France, during the First World War, March, 1917. 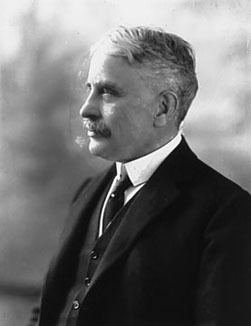 Borden knew conscription would split the country and cost him the support of Québec nationalists, who formed one pillar of his House of Commons majority. On the whole, French Canada — lacking a sense of allegiance to either France or Britain — had never embraced the war with the imperial vigour of English Canada. On the other hand, anglophone Canadians (outside the farm community) were increasingly demanding conscription as both a military necessity and a patriotic show of support for the troops in the trenches. That summer, the Conservatives proposed the Military Service Act, calling for the compulsory draft of men for overseas service. Demonstrations ensued in Québec. 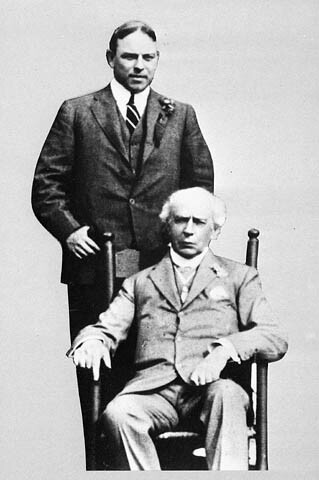 Borden decided the best way to bring conscription about — while placating Québec — was to bring his Liberal, francophone opponent, Wilfrid Laurier, into a wartime coalition government. 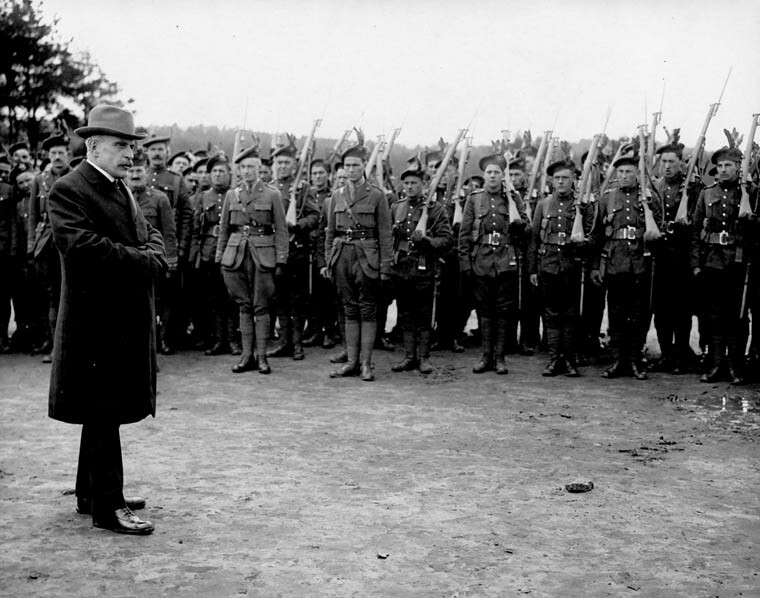 He offered the Liberals equal seats at the Cabinet table in exchange for their support for conscription. Laurier refused, but Borden plowed ahead anyway. After months of political manoeuvering, he announced a Union Government in October, made up of loyal Conservatives, plus a handful of pro-conscription Liberals and independent members of Parliament. One anglophone Liberal enticed by the Unionists, but who remained at Laurier's side, was the young, up-and-coming politician (and future wartime prime minister) William Lyon Mackenzie King. His refusal to betray his party at such a divisive time would vault him into Liberal leadership in 1919. Borden, in the sixth year of his first term, called an election for 17 December. It would be, essentially, a referendum on conscription. Voters would be asked to decide whether they — and their brothers, sons and fathers — should be forced by the government to fight and die overseas in a bloody war of attrition that seemed to have no end. Call it cynical and opportunistic, or the genius stroke of a master strategist. Either way, Borden engineered two pieces of legislation in the months before the election, stacking votes for the Unionist side. Under previous laws, soldiers were excluded from voting in wartime. 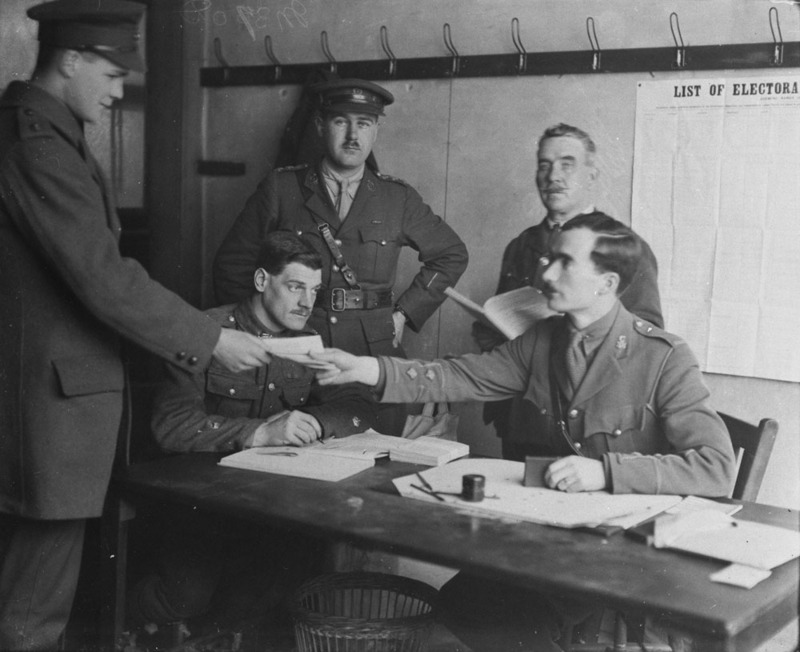 The new Military Voters Act allowed all 400,000 Canadian men in uniform, including those who were under age or were British-born, to vote in the coming election. Second, the Wartime Elections Act gave women the right to vote for the first time in a federal election — but only women who were the relatives of Canadian soldiers overseas. With these two laws, a vast new constituency of voters, the majority of whom supported the war effort and conscription, were suddenly enfranchised in time for the election. The Wartime Elections Act, while giving the vote to a certain class of women, also took it away from immigrants who had come to Canada since 1902 from enemy nations, mainly Germany and Austria — thus removing a block of voters likely to oppose Borden's Unionists. The Act also removed the vote from anyone exempted from the coming conscription draft, such as conscientious objectors. Angered by Borden's brazen efforts to manipulate the electoral rolls, the Liberals denounced the legislation. However, they found little traction in opposing a law that enfranchised Canada's soldiers overseas, as well as their mothers and sisters at home. The campaign for the "Khaki Election," as it was called after the colour of the army's uniforms, was the ugliest in Canadian history. As historian Tim Cook writes, the campaign "mirrored the war overseas: vicious, unrestrained, and with blood everywhere." Unionists attacked the Liberals' patriotism, and pro-conscription newspapers such as The London Free Press thundered, "Every vote cast for a Laurier candidate is a vote cast for the [German] Kaiser." Meanwhile in Québec, where the Union Government struggled to even find candidates, those brave enough to run under the conscription banner were threatened and attacked. In the midst of all this, farmers spoke out against both Unionists and Liberals, while farmers themselves were accused of bumping up food prices and profiteering from the war. The sour mood was made worse by domestic tragedy. As Borden campaigned across Canada, he was shocked to learn on 6 December of the Halifax Explosion, which devastated his hometown, killing 2,000 people — including members of many families he knew personally. 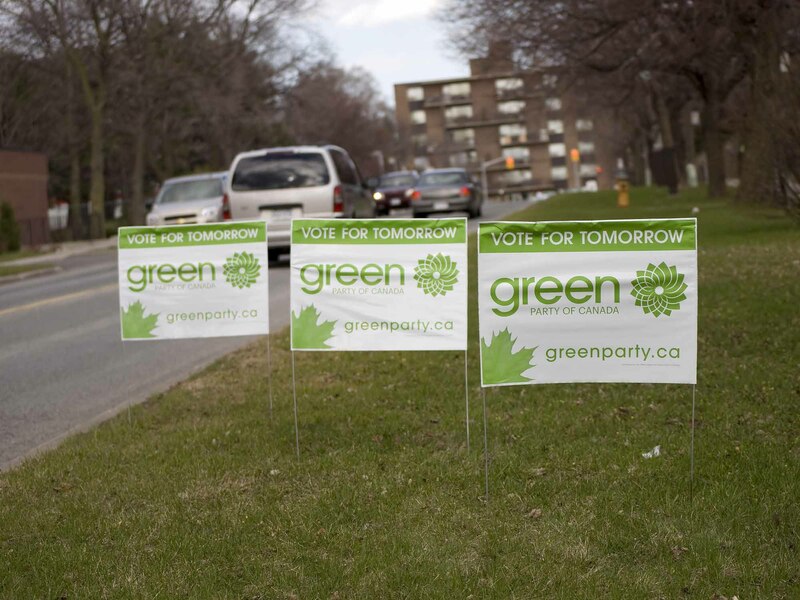 Eleven days later, Canadians voted. Borden's Unionists swept the English-speaking regions, returning to Parliament with a majority of 153 seats, including only three from Québec. Laurier's Liberals won 82 seats, 62 from Québec. The Unionists had won a resounding victory, but the country they now governed was scarred by the vitriol of the campaign, and divided. The issue at the heart of it all, conscription, hardly mattered in the end. In 1918, new Allied offensives had the Germans on the run, and the war would be over by November that year. Although Canadian battalions in Europe were bolstered by conscripts in the final months of the war, only 125,000 Canadians — just over a quarter of those eligible to be drafted — were ultimately conscripted into the military, and of those only about 24,000 were sent to the front lines. A more lasting consequence of the election was the political isolation felt by Québec — a fact that would hurt Conservative fortunes there, and haunt Canadian unity, for generations to come.